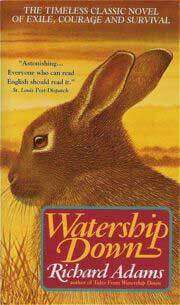 Watership Down has been a staple of high-school English classes for years. Despite the fact that it's often a hard sell at first (what teenager wouldn't cringe at the thought of 400-plus pages of talking rabbits? ), Richard Adams's bunny-centric epic rarely fails to win the love and respect of anyone who reads it, regardless of age. Like most great novels, Watership Down is a rich story that can be read (and reread) on many different levels. The book is often praised as an allegory, with its analogs between human and rabbit culture (a fact sometimes used to goad skeptical teens, who resent the challenge that they won't "get" it, into reading it), but it's equally praiseworthy as just a corking good adventure.